When I think of tryouts I think of the following emotions: nervousness, anxiety, excitement, eagerness, pressure. This is a time, in my mind, where a player is tested mentally, even more than she is tested physically. If you have practiced hard and worked hard during the summer, a try out should feel like just another practice in terms of what you are about to take on physically. That’s the mindset you should have. You’ll take some ground balls, you’ll throw each of your pitches and you will take some swings either off of front toss or a machine. Your PRACTICES are where you should have been fine tuning some mechanics and working on fundamentals to make you feel COMFORTABLE heading into the tryout. The tryout is NOT the time to fix mechanics and worry about making changes in your pitches, throw or swing. How are you going to respond when eyes are on you and it’s your chance to take those swings in front of everybody? How will you handle the pressure? A tryout is just like a game! It adds pressure to completing the skills you were born to do. You can either take that pressure, work through it, and learn to shine. Or you can feel that pressure and crater. I would be willing to bet that the players who crater at tryouts are the players who are not successful in a pressure situation in a game, either. Here’s the thing: It’s all about what your inner thoughts are telling you, and also what your parents have been telling you leading up to the tryout. How YOU are handling the conversations with your daughter days and weeks before the tryout is going to affect how she handles the pressure of the big day! How you handle her successes and failures in every day life are going to be in her mind when she is at the tryout. Is she afraid to let you down? Does she know that you support her no matter what happens? Can she feel from you that you are more worried about her well being, attitude and work ethic than you are about the results from the tryout? Explain to her in different ways that the tryout is NOT something to be fearful of, but the tryout is an OPPORTUNITY to SHOW a coach what she’s got! If you have worked hard and prepared for this opportunity, then you should feel excited about it! If you didn’t work as hard as you possibly could during the summer, and then you show up to the tryout, THEN that stands for grounds to be scared, unsure and anxious. I would feel the same way if I didn’t prepare for something…any of us would feel that way! The best thing you can do as a parent is keep reminding them of their preparation, to believe in that and to stay within themselves. Remind them to breathe, and also remind them that it’s not the end of the world if they don’t make it. Try to take away pressure, not add on to it. Have a backup plan if the #1 team you want to go to doesn’t want to take you. This is a perfect opportunity as a family to have a contingency plan, and remember that EVERYTHING happens for a reason. Yes, EVERYTHING. Of course, if you don’t make the team you wanted it’s a bummer and you can feel like you aren’t good enough. BUT choose to look at it in a different light. If you don’t make one team, it means that there is an open door for you somewhere else, which is most likely going to be a better fit anyway. As a parent, you MUST have faith and stay positive for your daughter during this situation. If your daughter had a bad try out, it’s ok! The experience alone was valuable for her to go through and LEARN. Failure is our best teacher. Because of that experience, before the next try out (whenever that may be), you can make some adjustments and think about what you want to do differently at practice and in your conversations to assure that that doesn’t happen again. It should drive you more than it makes you sad. Don’t DWELL on the bad tryout. It happens!! Just like a bad inning in a game happens! There are SO many different questions you may ask about tryouts. About a week ago, I asked my Facebook friends to tell me some of their top questions heading into tryouts, and below are some of their questions! Important to remember: there is NO SET answer for ANY of these questions. I base my answers off of experience of being around the game as a player and a coach, and also seeing what OTHER people have experienced to give my best advice. Q: Is Gold ball really worth the more than $12,000 cost per season (membership, airfare, hotels, meals, gasoline) or if my daughter is good enough will she be recruited without playing Gold? If Gold is the way to go, at what grade level do we make the switch? A: – First of all, there are SO MANY different directions to take this question, sooo that is why my answers are a little bit diverse. LOTS to consider, but wanted to give you a little bit of insight to a few things…. – When entering the college recruiting world, remember that there are many different levels of collegiate ball. Most people think of college ball and only think of the top Division I schools like UCLA, Texas, Florida, Oklahoma, etc. There are SO many more schools than that in terms of Junior Colleges, NAIA, Division II and Division III. There are SO MANY opportunities to take your game to the next level that are outside of “The Dream Schools.” When you are thinking of Gold ball, most of the top athletes in the country are playing at that level on the top teams at the top tournaments which draws in the top coaches. In my personal opinion, the word “Gold” doesn’t mean anything anymore, it’s so watered down and it has lost its allure because of its overuse. Every team wants to be a Gold team, even if their talent doesn’t necessarily match the “Gold” criteria. At the 18UGold level, since they comprised of older girls, a good majority of those girls are already recruited and committed to go play ball, since many of them are Juniors and Seniors. If the big Division I college coaches are there at those games, yes they are recruiting a little bit, but usually at that level they are just going there to WATCH the girls they have already recruited to go and play at their schools. The smaller schools will be at those 18U tournaments looking for the uncommitted/unsigned juniors and seniors. (Players are verbally committing to go to a school in 8th and 9th grade, it’s CRAZY). So playing Gold ball is NOT the only way to get seen because college coaches are recruiting at these different age levels, too. Lots of them will be at 14U and 16U tournaments, as well in order to get an early look at those players who will eventually get up to the 18U level. College coaches want their players to play on the BEST teams because those top teams are playing in the top tournaments against the top teams in the tournament – which gives them invaluable experience and makes them compete at an even higher level. Because of that competition level and how that prepares a player to play at the next level, you can see why college coaches would want to recruit players who play at the highest level possible when they are playing on their select teams. – I WILL tell you, in order to be recruited, you do need to play travel ball to be able to get the exposure to the college coaches. There is probably a 90-95% chance that you will NOT be seen by JUST your high school team. College coaches do not usually go to high school games to recruit. My best advice in one sentence to truly answer your question: Play on the BEST travel team that you can play on where your daughter will be in the starting 9/10 on the team. It does NO GOOD to be on one of the top teams and not play. You are missing out on getting seen by college coaches when you are sitting the bench AND more importantly, you are missing out on game-time experience to prepare you to play at the next level. – Lastly, in regards to getting recruited, you need to start EMAILING coaches and putting your name out there to them. Send emails to the schools that best fit your critieria. Maybe you want to stay close to home. Maybe you want to go far away. Maybe you want a high academic schools. Keep your options open and take TIME to understand what the options even are. They are ENDLESS. But the player must decide what is the criteria she wants in a school, and then consistently email coaches and keep your name fresh in their minds. College coaches are getting 100’s (literally) every day and you need to find a way to be different and stand out. When is a good time to start emailing coaches? If you are serious about playing ball in college, you should start emailing coaches in 8th or 9th grade. If you are older than that right now and reading this, then get on it! My favorite college recruiting website is NCSA. They post SO MUCH helpful information. It’s the best site I have found out there. Their Facebook page is full of amazing tips. Q: What should parents/players look for in a team? How do you pick the best fit – what should the decision be based on? A: – There are so many things that fit into a decision personally for YOUR family. You can base it on finances and how much the team is traveling around and if you are able to afford that commitment. You can base it off of how serious your daughter is about wanting to play in college. The more serious she is, the more she should be traveling around to be seen in showcase/exposure tournaments with college coaches. 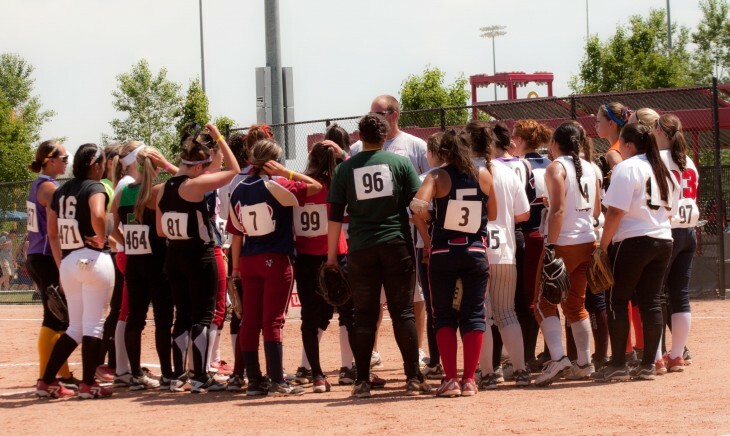 You can also base how serious your daughter takes softball as to how much she is practicing and the time she is willing to commit to playing in tournaments on the weekends and practicing during the week. With that being said, are you, as parents, going to be able to make the commitment to driving her around and taking her to different tournaments? – More specifically regarding the team, I think you should also base your decision off of the coaches – this is a big one! Ask around about their personalities and how they treat their players and how they are DURING the games. Do they have daughters on the team? If your daughter is a pitcher, how many pitchers are they going to take on the team? I think it’s good to ask them point blank and get an honest answer about where they see your daughter fitting in to the lineup. Ask the hard questions BEFORE you commit to being on the team. Sit down as a family and think of questions that are important you know the answers to. – I would NOT base it just off of if your daughter has friends on the team. That can be a big one that younger players hold on to. You can make friends. It’s good to get out and meet new people and explore new things! It challenges a player to become more social and make them a little bit uncomfortable! LIFE is about being uncomfortable in some situations and learning how to deal with it and handle it. She can make NEW friends and still have the OLD friends she played with before. Q: Should you move a kid up in age group to challenge them or leave them down to shine and build self confidence? A: I like for a player to stay down and play in their age group, especially in 10U, 12U and 14U. To me, this experience of “shining” can yes, give a player confidence, but also teaches them to be a leader and a player that their teammate looks up to. In my mind there is no rush. NOW…with that being said, if a player is simply not being physically challenged enough, I think it is in their best interest to move up to be humbled, learn failure and how to play against the big girls. I think the best person to make this decision is NOT the parents. Usually parents (no offense parents) think much higher of their player than an unbiased opinion would from their team’s coach or their private lessons’ coach. Be honest, be real. Don’t move a player up just to be able to brag about it to other people. That is not the point of playing up. Playing up should be something that is earned and NEEDED and it should have NOTHING to do with ego. 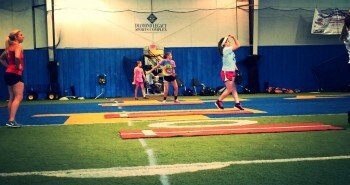 Q: How do you demonstrate “softball smart” at a try-out? Seems like most coaches look for pitchers/catchers and shortstops, how do you make yourself shine at a try-out if you are not one of these? A: GREAT QUESTION. If you make an error, you rebound quickly by having great body language and a positive attitude. Don’t let it affect you. 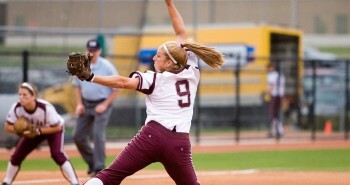 Players stick out who have a certain softball savvy without even TRYING to have that look. They just walk on the found and have it because they are, like you said, “Softball smart.” They are confident where to go with the ball. They don’t question themselves. Also, be LOUD with communication to call a ball or to cheer on other people at the tryouts. Make new friends, be social and friendly. Pick up another person trying out when they are struggling. You can show signs of being a great teammate even when you don’t necessarily KNOW other people. Lay out for balls. Hustle on and off the field, no walking. Ask for extra reps if there is time. Ask the coaches questions. Stay after the tryout and introduce yourself. Play fearlessly. Do not just fade in with the rest of the crowd with how supportive, energetic and passionate you are. Make yourself stand out and be known. Along with these intangibles, either shine with your speed or shine with your swing! If you are really fast, you will stick out. If you have a pretty swing you will stick out. If you hit for power you will stick out. Coaches love offense. Know what your strength is. When it is your chance to go up to the plate and show them what you’ve got, you have to take advantage of that opportunity to shine! I also found this article, and it has some great little tips! Q: Is it okay to try out for different teams even though you are staying with your current team so you see have you stack up against the other girls out there? A: If you are really wanting to do this, I would say it’s VERY, VERY important to have an open, honest conversation with your current coaches. I would think the other coaches at the other try outs might think you are wasting their time when they are needing to evaluate players at the tryouts who are there really wanting to be seen? – that comes into my mind when I think of doing that. Finally, I personally think the BEST way to see how you “stack up” against other girls is to do it on the actual playing field come game time. Featured image from Ringor.com and this website. Thank You for time you take to write these helpful tips/Q&A. This will be the first time ever for my 13yr old to try out for a couple of teams. The teams she has played with did not have try outs. I know she is nervous so I keep reminding her do your best and don’t let one mistake define you. Make it up on the next play or at bat. I Love a lot of your facebook postings so I show them to her since she doesn’t have facebook. Where can I find any info on camps or clinics you host? We live in San Antonio Tx. Good words of wisdom to not let one mistake define her! “Work your hardest” sounds better to me than “Do your best.” DO your best puts a little bit of extra pressure, because then if she doesn’t do her best, it will cause her to get down! Just friendly advice. Most of my camps are through http://www.packageddeal.com. We are setting our schedule right now for the fall! Also, on my Facebook page I list other small mini clinics I do on my own. Thinking of doing one in Austin on Friday, August 15. Just posted something on my Facebook page about it. As usual, you nailed it! Right or wrong I tell my daughter that this where she gets to show off. All the work she has put in will allow her to take adavantage of the opporutnity when it presents itself. At the end of the day it is just a game a failure comes with it more often than not, just look at the averages. If they think that not making the team is a bummer, you can always remind them that summer is almost over and school is about to start, bigger bummer! LOL This will get them to focus on the fact that it is just a game and there are bigger things in life than softball. Even though we all love it. Thanks for sharing. Amanda, Thank you for sharing the great softball information. You are a wealth of knowledge! I think it happens RARELY I am not saying it WON’T happen. But you are more likely to be recruited on your travel team because they are traveling to where all of the college coaches are! Dear Amanda thank you for letting me k ow how u feel when u r trying out for a team. Thanks. My daughter is young at the age of 6. This is new to me and her. I love watching her play. How do I balance pushing her but at the same time making sure it’s still fun for her? If she’s 6 it should ALL be fun right now!!! Let her do it for the fun of doing it to see if she enjoys it. Pushing shouldn’t really come until later ages if at all! Thanks for responding! Your articles and advice does help! Thanks again. Wow- this article hit close to home! My daughter has played on an 18u “elite” team this year and went to a lot of showcase tournaments. This seemed to really stress her out… She was the starting pitcher as a incoming high school Softmore. Now she wants to go back to non-showcase tournaments to have fun. She wants to play for a division 1 team, so I guess we will have to find the right team with balance..? I appreciate your experience and insight on a complex journey we have in front of us! You have been very helpful!! Amanda, your advice really motivated me as a young softball player. I already feel less nervous about my upcoming tryouts.